Against the Grain 2017 LE. The Shave Room 2015 LE (21/30). Badger and Blade 2014 Rudy Vey LE (43/50). 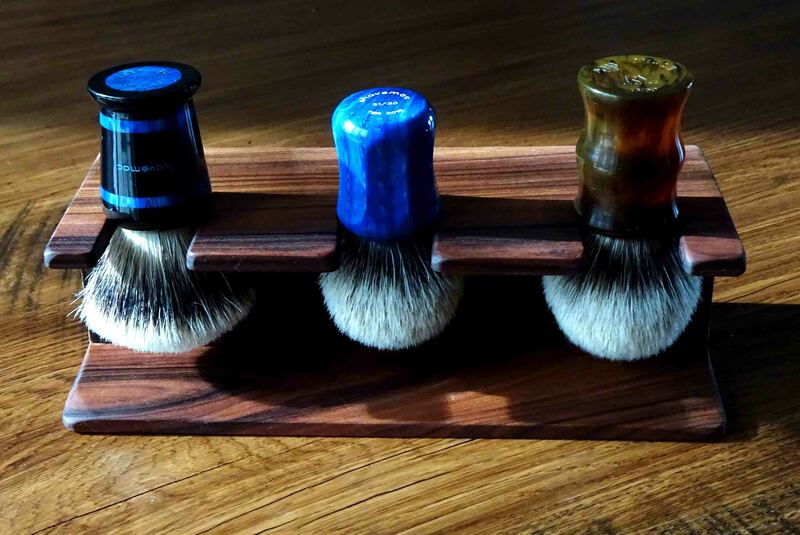 The homemade shave stand is Bolivian Rosewood. This is the first stand I have made where the brushes are supported by the top of the handle. This is easier than hanging from the bottom of the handle due to the variance in the diameter of the handles. With this stand, I drilled out the support holes to 30mm and used sandpaper to adjust as needed. Very nice stand, rosewood is a beautiful wood but very hard and difficult to work with. Nice knots and support. I only assemble ikea furniture, that's all I can do with wood. Nice job , my friend. Really like the color of that stand wood. That's a top notch stand congratulations! !